Back in my college days, I was quite an emotional mess. Well, I still am but I'm Canadian now so it's different. I needed to buy food just so I have stuff to do. That's why I'm so large now. When I'm bored, I eat and I'm bored A LOT. So I was feeling down in the dumps that night. I hated the organization. I hated some people. I was still not over a girl I really liked. I needed a drink but this was before I was constantly getting drunk after class. So I go to a milk tea place called Moonleaf. It's one of those expensive milk teas because... I don't really know why. When you order in Moonleaf, they have to get your name but I didn't feel like giving out my name and I was grumpy. When my tea was done, I got it and this was written on the cup. This actually helped me improve my mood that night. I needed a smile and it didn't matter who gave it to me. 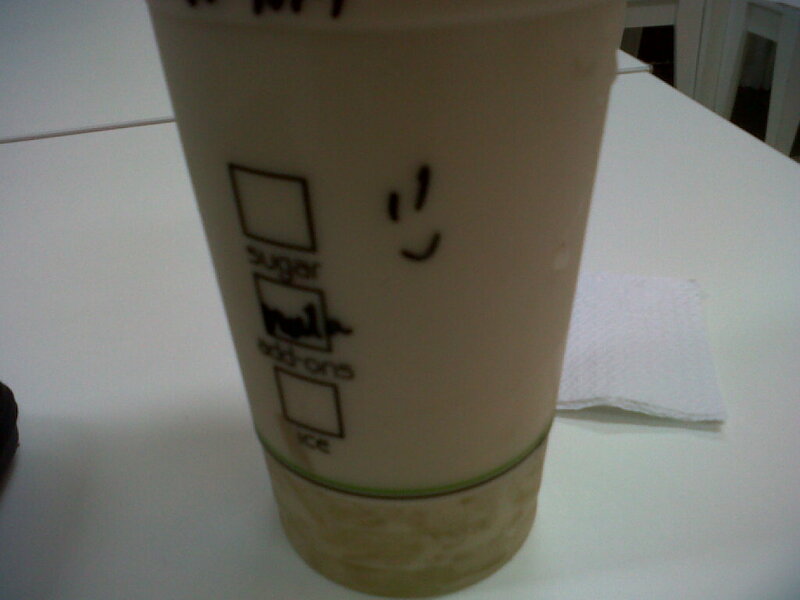 I smiled because someone drew a smile on my milk tea cup. Yeah, that's how messed up I was at that time.